Toyota may consider mergers or acquisitions to procure new automotive technologies, including self-driving technologies, the company's president said yesterday, adding that it had to compete more aggressively against its rivals. 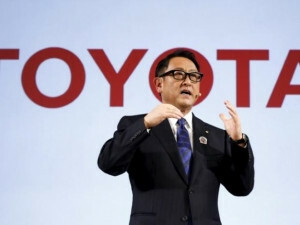 At an annual shareholders meeting, president Akio Toyoda said the world's second-biggest automaker, which took longer to warm to self-driving cars and electric vehicles (EVs) than its rivals, would be more aggressive in expanding in these areas, conceding he may have focused too much on preserving the status quo at the firm until now. "The auto industry is undergoing big changes, and issues and ideas which we may have thought were far off in the future could affect us tomorrow. That's why we need to go on the offensive while also preserving our areas of strength," he said. "We've been investing one trillion yen ($9.08 billion) each year for R&D, expanding capex and buying back shares, but this may not be enough. We need to consider all our options, including M&A, to survive in the future." As the rise of self-driving cars increasingly blurs the lines between automakers and technology companies, global automakers are trying to expand their role beyond making cars into transportation service providers, raising their research and development budgets and investing heavily in technology companies. Toyota has invested $1 billion in an artificial intelligence research institute, and has struck up technology partnerships with Microsoft and Uber. It has also opened up to more companies beyond its group suppliers, including tech company Nvidia to procure more software for its automated driving systems. The automaker plans to launch a car in 2020 which can drive itself on highways. Meanwhile, rival Nissan is already aiming to get cars that can drive autonomously on city streets in that same year and General Motors says it has begun to mass-produce self-driving test vehicles. Toyota also has yet to ink a major capital tie-up with outside companies, after GM scooped up US autonomous driving technology company Cruise and partnered with ride services firm Lyft, while Ford has acquired ride-sharing service Chariot. Toyota late last year set up an electric car division, belatedly entering a market where Nissan, GM, Volkswagen AG and other automakers already have offerings, as it continues to bet on hydrogen fuel cell vehicles as the zero-emission car of the future.